u m a m i: Honey, what's for dessert? 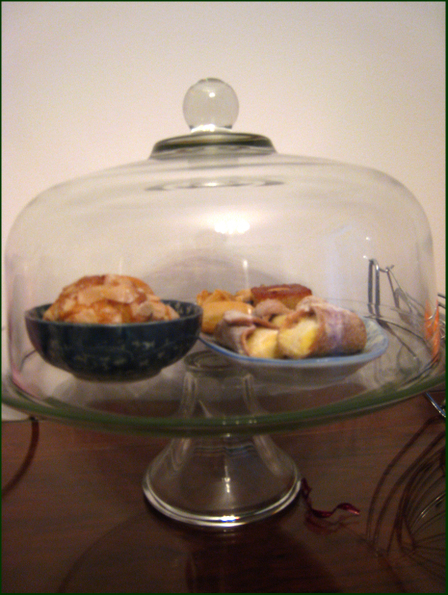 This cake stand was purchased at Williams Sonoma, San Francisco on my first trip there circa 2001. I lugged it all the way back to Singapore, where like so many other implements it languished in the pantry. I am not and probably shall never be a prodigious cake maker. 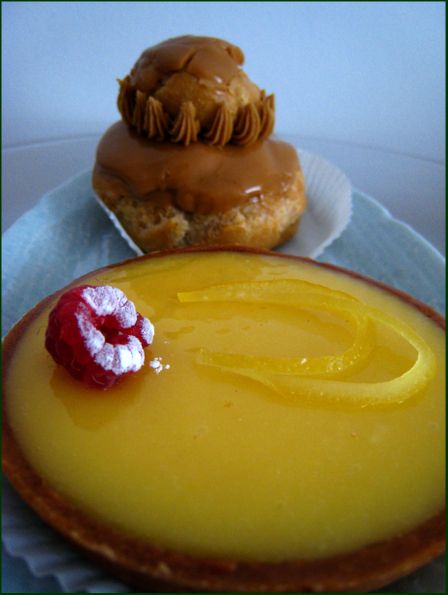 But now we are in Paris, land of magnificient pastries, why bother making when you can readily purchase these indulgent treats. Thus was borne the idea for this series. Every month I will post the desserts that we have served at home. Most if not all will be shop bought, we intend to eat our way, slowly and with moderation of course, through the pastries in this city. Not shown unfortunately is three slices of elegant cakes from Sadahoru Aoki, elaborately composed of ganaches, mousses, fondant, sponges and I dunnowhat, the four of us gazed in awe, ate in silence and wandered at the ephemeral delicacy and gorgeousness. No time to even think of taking out the camera. Here are more 'everyday' offerings. The routine is thus: we'll put any sweets in the stand which sits on the dining room sideboard. Then whoever comes to the dinner table will know that there is dessert that night and it will be something pretty and sweet. We count ourselves very blessed to be within spitting distance of many Lebanese eateries. Noura on one side of my block, and Al Diwan on my left. As we turn right more often than we turn left, especially when we shop for provisions, Noura has been getting all our business in January. We'll hear more of Al Diwan next month, promise. 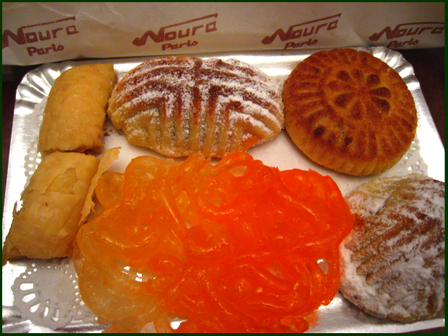 The first time we popped into the Noura's delicatessen, Ave Marceau, husband went a little crazy, he thought the cakes above were tau-sar-pias. Ignoring my warnings he went ahead and chose a few, then he got a shock at the cash register when he realised that these things are sold by weight! Next, we bit into some of them and found them to be densely packed with date pastes, nut pastes etc, and encased in strongly scented almond pastry. Too heavy for our tastes, but they keep for days and GG who has a sweet tooth finally ate them up. I too made a mistake with the jallebi lookalike, it was sweet enough to give any dentist instant caries. 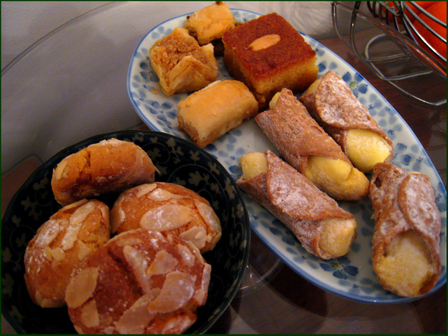 But it is never a mistake buying the baklavas from Noura's. Or the almondy gooey cake. 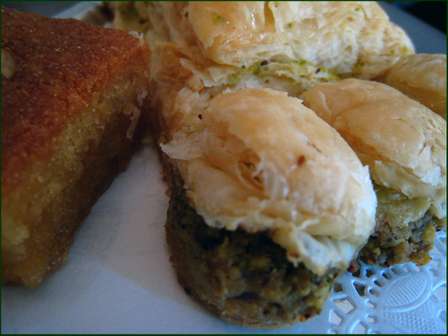 Always impeccably fresh, with multiple layers of melting crisp filo pastries, light flower scented syrups and nutty nuts, we have to ration ourselves to one piece per sitting, otherwise we would just grow sideways. There are at least 20 boulangeries within 5 minutes walking distance of our apartment, but we always go back to Mi Do Re, on Rue de Chaillot. Maybe it is their bright lighting, or their chirpy service, or that little tray of something that customers can sample (brioche today, cereal bread another day), or the appetising range of sandwiches that is irresistable to the locals, especially come lunchtime, whatever the X factor is, Mi Do Re is always busy, and not so cookie like in its offerings, I've passed by many boulangeries to see the similarities. Their goods look just that bit more glistening, more mouthwatering somehow, maybe I'm biased. But it is true we are always stopping by for something or the other. Above is their pear and chocolate tart, we shared it between four people. At first husband was disappointed that there was only 1 piece of cake on the table. 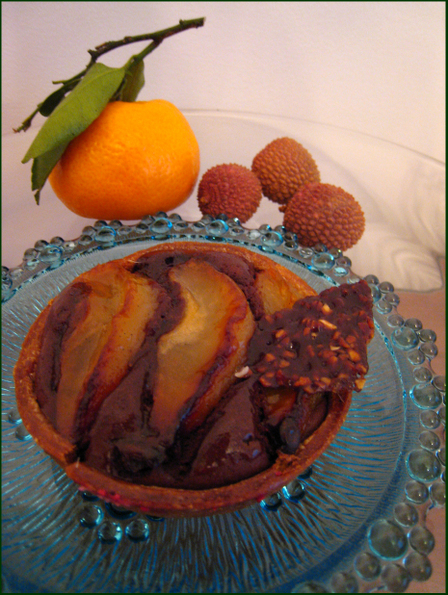 But a quarter portion is enough to satisfy our sweet teeth, what with the sweet short pastry, chocolatey base and fresh pear slices. More from Mi Do Re. Their citron tartelette is nicely tart yet smooth and rich. I love citrus more than chocolate so this was the second time we had it. The double puff assembly is fancifully called Religeux, it was really indulgent with plenty of coffee icing. Another source for sweets is the President Wilson Market. The Italian stall has these crumbly almond cookies which are great with coffee. The cannolis were bought by sister who was astonished that I've never had them before. To be honest I didn't like them very much, the filling reminded me of buttercream which I'm not too keen on, but I'm keeping an open mind about cannolis. The Italians are mad for them apparently, so there is probably nicer versions out there.